Based on the Peaches and Cream Cupcakes recipe from The Hummingbird Bakery book. These were fairly straightforward to make, nothing overly complicated. I opted to not ice them as it was too soon after the Ginger Cupcakes debacle, and I couldn't face making another batch of icing. 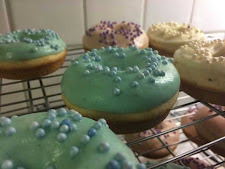 Instead I used vanillinsocker, which is essentially vanilla flavoured icing sugar, and sprinkled it over the top. I renamed them 'Sticky Peach' cupcakes, as they did become very sticky, even before they had been dusted with the vanilla sugar; this may have been because I stowed them away into a tub when they were not completely cool (although they were pretty much cool). Also as there is no cream in the mixture, this part of the name must come from the icing, so I would have been slightly fraudulent if I had stuck with the original title. I am personally not a fan of fruity cakes, whether the fruit is incorporated in the batter, or on the bottom/top. I like them even less when they make a layer, as there is that slightly sticky residue that occurs where the batter meets the fruit, so I was not overly impressed by these cakes, however as per usual, they were eaten by my ever willing colleagues - mainly because they were cakes, rather than that they were good.